Discover the lost city of Atlantis below the cool surface of the oceans for a chance to uncover the untold fortunes buried with this ancient city. Click here to play! You’ve been chosen to accompany an elite squad of divers to head to the bottom of the oceans to uncover the lost city of Atlantis, and document all of the unique treasures of this lost civilization. You’ll definitely want to document the spiraling vortex, as this symbol could be the key to the city’s unusual history. It is also a wild symbol that will replace most others to help you create more winning combinations. There are plenty of other symbols to log into the records such as the diamonds. These valuable symbols hold a top payout of 2500 times your line bet if you can spin two or more across an active payline. There are also warrior helmets, jeweled pyramids, maps, underwater safes and vehicles, and gems to name a few. Though you’ll want to spin in all of this in order to thoroughly document this lost city, there’s one symbol that are very important. This includes the scatter shields and swords. This symbol will trigger a number of free spins if you can spin three or more. 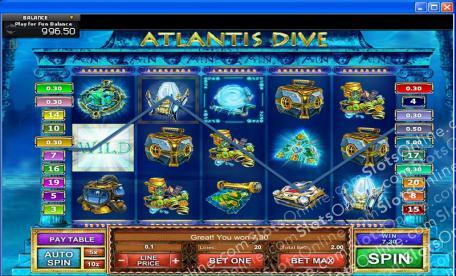 So, dive to the depths of the ocean to uncover this legendary city and you could resurface with a princely fortune! The decorated blue shield and sword symbol is a scatter. It will trigger a number of free spins if you can spin three or more anywhere on the board. The swirling vortex is a wild. It will replace all others, excluding scatters, to help you bring in more winning combinations. This game offers something a bit different in the way of bonus features. Rather than a standar on or off the reels game, there are three symbols that hold a special payout if they appear anywhere on an active payline.